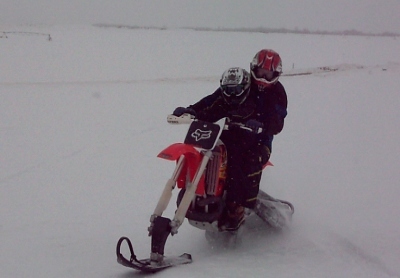 Dirt biking, snow skiing, snowmobiling reinvented. Wow! That was the large bold neon sign flashing on and off in my brain a mere 10 seconds after throwing a leg over Joe and Jake Kopplow's CR500/2Moto snowbike (well, more like 60 seconds after since I fell off on my first launch attempt). This thing, I thought to myself, freaking rocks. 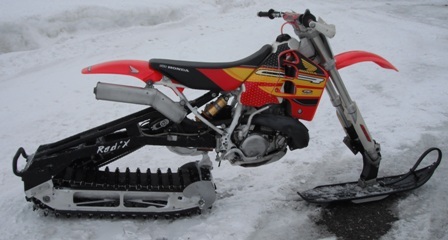 The 2Moto Radix snowbike conversion is a kit that converts nearly any dirtbike to a narrow-track snow machine that is exceptionally well-suspended, stable at speed, turns on a dime and an absolute gas to ride. Rarely have I had as much fun in a day in the snow even though I hyperextended my knee on the first tipover. All was forgotten as soon as I got the snow bike up to speed for the first time. The 2Moto snowbike is dirt-biking, skiing and snow-machining all redefined at once and combined into a single package that is simply a hoot. You want one of these. A detailed review of the 2Moto (by MoJazz contributor Jake Kopplow) will be coming soon and we'll have a long term review just as soon as we can get our hands on a 2Moto of our own for our MoJazz CRF450X Project bike. We are already working out the logistics for a winter version of the Tour of Idaho. The 2Moto Radix kit consists of a front ski (available in hardpack or powder configurations) and a self-contained rear track assembly. 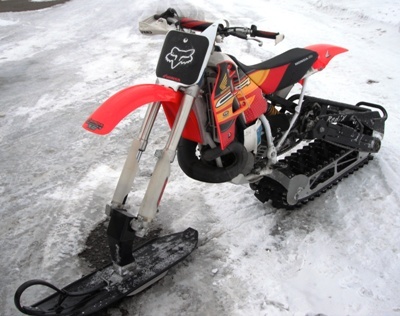 To convert any dirtbike to a snowbike the front wheel and brake are removed and replaced by the front ski, the swingarm and airbox are removed and replaced by the rear track unit and a custom air cleaner (supplied). Jake and Joe tell us that the conversion takes less than two hours in any reasonable well-equipped shop. One of the first things that is apparent about the 2Moto Radix unit is the build quality: it's made of really beefy material, and everything that is pre-assembled (most of it) is very well made. Fit and finish are top-notch and the 2Moto looks like it will stand up to years of hooligan-esque abuse. The welding, machining and fitment are of sufficient caliber that, in terms of quality, it was difficult for us to tell where the Honda ended and 2Moto bits began. No higher praise is possible. The 2Moto unit comes with top-shelf Ohlins suspension and an impressively powerful disc brake that is much more effective that one might think. We sampled the powder ski and found it to work great in the inconsistent crust and crud that dominated our extended demo ride. The track is driven by chain right off the countershaft sprocket (no jackshaft) for efficient power delivery. Steering on the 2Moto is a tad heavy until you get the hang of it. In order to turn quickly you have to initiate things with some bodacious lean (photo at left) and a liberal dollop of throttle. Once the technique is mastered (no countersteering) the 2Moto turns on a dime. The only other thing that feels unusual (at first) is the lack of gyroscopic stability from the front end. As long as the front ski is on the snow the bike is stable, goes where you want and feels solidly planted. But as soon as you loft the ski in the air the lack of angular momentum from the front end becomes immediately apparent. Wheelies are a new experience - at first anyway. Handling is exceptional courtesy of the first rate suspension, near perfect fore aft weight balance, tenacious track bite and excellent feedback. Sidehilling is easy due to the narrow track. The conversion kit weighs just a little more than the bits it replaces so the snowbike conversion involves little additional weight. Before I became interested in motorcycle racing (around 15 years ago) I spent a decade working as a certified ski instructor and during this time I skied well over 1000 days. The 2Moto really opened my eyes to some possibilities I had never considered in spite of a lot of time on snow. The 2Moto is a way better tool for accessing backcountry skiing than a snow machine. 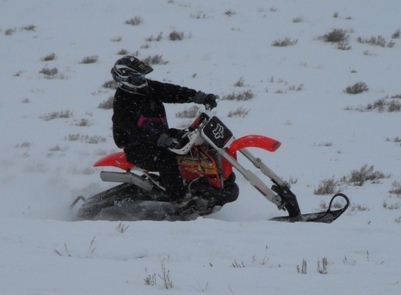 Riding the 2Moto is much more like skiing than snow-machining (I think that backcountry skiers - like me - could be a great potential market for 2Moto). Millions of vertical feet of skiing have ingrained in me a sense of the fall line - something that's necessary for gravity-powered downhill skiing. The 2Moto permits the novel experience of skiing uphill. Never have I considered the possibilities skiing movement over snow not restrained by gravity or momentum. It's quite the treat. We intend to acquire one of these even in it involves selling blood. Many thanks to Jacob and Joe Kopplow, 2Moto dealers, for an extended demo ride.